When eating for your heart, there are some foods that are better than others. These foods tend to be very high in certain nutrients, antioxidants and specific types of fats. In order to protect your body’s most important organ, you must fuel it properly. 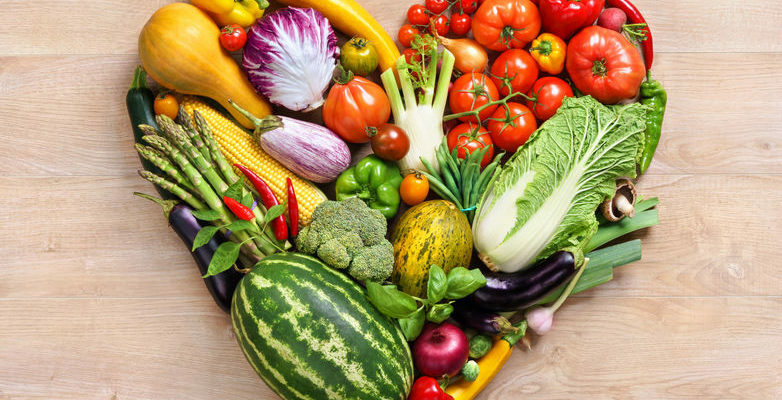 You can essentially boost heart health by what you eat. Below are the top foods to power your heart. 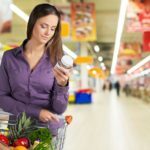 Whether you’re young or old, these cardioprotective foods are critical to adding into your diet daily. Fatty (or oily) fish such as salmon, mackerel, herring or sardines are rich in essential omega-3 fatty acids. The body needs fats and it can make all but two of them: omega-3 fatty acids and omega-6 fatty acids. These are both essential fats that must be supplied by the diet. 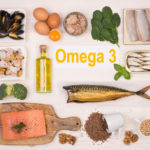 A proper ratio of omega 3’s to 6’s is needed (the more omega 3’s the better) and is usually around a ratio of 4:1-10:1. Linolenic acid (omega 3) is the one known to be critical to heart health. There are two types of Omega 3’s: EPA and DHA. Both of these fats are highly anti-inflammatory fats found in seafood and fish. They have been shown to be “cardioprotective” as they have been associated with lowering blood pressure, reducing blood clots, protecting against irregular heartbeats, and decreasing inflammation. Recent research even suggests omega-3 fatty acids can lower one’s risk of coronary artery calcification1. 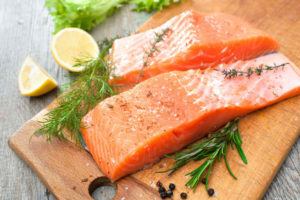 Wild-caught fish like salmon, which are dark pink to reddish in color, are also high in carotenoids that stem from the diets of these fish. Color counts here. These natural, pigment carotenoids called astaxanthin are very protective for the heart. Astaxanthin helps protect your skin and is also found in shellfish like shrimp and lobster. Here at the Drs. 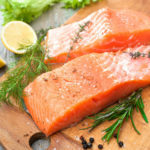 Wolfson we consider salmon, sardines and other omega-3-rich types of seafood to be SUPERfoods due to their wide range of benefits. Dark green, leafy vegetable such as arugula, kale, Swiss chard and even microgreens, are highly nutritious for the heart. They are rich in natural nitrates, which get converted in the body to a cardioprotective molecule called nitric oxide. 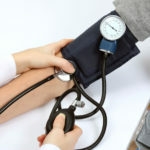 Nitric oxide can naturally dilate blood vessels, increase blood flow, prevent blood clots and even reduce blood pressure. Overall, it supports a healthy heart and circulatory system. Leafy greens are also rich in the minerals potassium and magnesium, which play a role in regulating healthy blood pressure. These vegetables also contain adequate amounts of fiber, which helps to normalize blood lipid levels for proper cholesterol balance. Leafy greens also have exceptional amounts of vitamins A, C and K1, as well, which help the heart function properly. Additionally, they contain a high level of antioxidants and phytonutrients, which protect the heart from the strain of inflammation and oxidative stress as well as in preventing plaque formation. 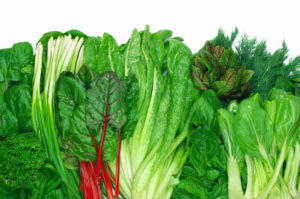 Read more about the top leafy greens for heart health here. Berries and cherries tend to be richly hued in color, which also means they are rich in antioxidants (the plant pigments that give them their color) called anthocyanins. 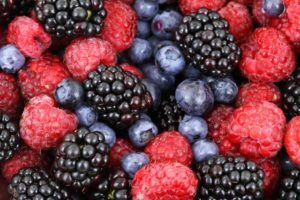 You can think of anthocyanins as helper molecules to the heart as they protect blood vessels and keep them functioning to the best of their abilities. There are many berries to choose from to reap the benefits. Blueberries are especially high in anthocynanins, can aid in blood pressure control and restore the elasticity of your blood vessels. Blackberries are one of the best berries for fiber content. One cup of blackberries packs in 7 grams of fiber! Raspberries are full of vitamin C, a vitamin that has been revealed to have an effect of lowering blood pressure, which is heart-healthy! Strawberries contain folate, which is a B vitamin that has been shown to play a role in preventing heart disease. Cranberries can help to boost HDL, the “healthy” scavenger cholesterol responsible for protecting your arteries. Dark cherries are rich in anthocyanins and other anti-inflammatory compounds that can ward off inflammation, prevent oxidation of cholesterol and regulate blood pressure. Cherries are an excellent preventive food for gout. Avocados, or avocardio as we refer to them, are one of the healthiest foods for your ticker. Another one with SUPERfood status, the avocado should be a part of your daily diet. Avocados are rich in monounsaturated fats. These types of fats are the main staples of the famed Mediterranean Diet and have been linked to a lower risk of heart disease. Monounsaturated fats have been associated with normalizing cholesterol levels (by boosting HDL) and preventing blood from clotting. Avocados are also rich in vitamin E, a protective antioxidant vitamin. They also contain beneficial amounts of magnesium and potassium, which aids in controlling blood pressure and heart rhythms. 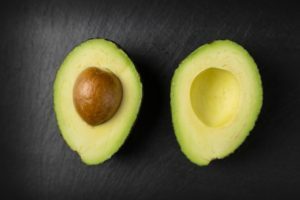 Avocados can also increase satiety (keep you feeling fuller for longer), which in the long run could benefit weight management. 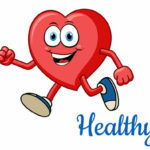 Weight gain is another risk factor for heart disease. The avo is a tremendous source of fiber with proven benefit of heart protection and cancer prevention. Check out other interesting benefits that occur with regular consumption of avocados. Citrus fruits are high in vitamin C. Vitamin C is good for the heart as it boosts immunity, combats oxidative stress and fights inflammation. 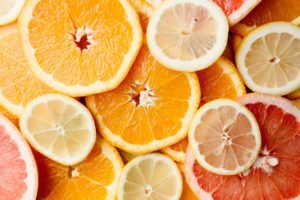 In fact, a recent review of the research concluded that there was a significant association between individuals with a vitamin C deficiency and a subsequent increased risk for cardiovascular disease complications2. Some research also suggests that vitamin C can improve endothelial function, arterial stiffness and even regulate blood lipids2. Additionally, vitamin C, as a precursor, is needed for the formation of collagen. Collagen is a protein that is needed for the overall health and maintenance of the heart muscle. Vitamin C also functions as an antioxidant, which wards of harmful molecules in the body before they can cause damage to healthy cells. This is an important process. By preventing these harmful molecules (known as free radicals) from causing cellular damage vitamin C is also able to prevent inflammation, a known risk factor for heart disease. Citrus contains naringin, a molecule proven to support healthy LDL and HDL function. Be sure to eat citrus fruit daily to ensure heart health! Beets are required for normal heartbeats! Beets & their leafy counterparts (beetroot greens) are also major SUPERfoods. There are so many heart-protective effects of beetroot greens. Beets and beetroot greens are full of natural nitrates. Again, these nitrates produce nitric oxide, which is needed to support proper blood vessel function and normal blood pressure. 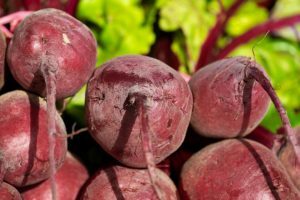 Beets are also rich in betaine, a compound responsible for lowering homocysteine levels and preventing plaque formation in the heart. Elevated homocysteine is associated with heart disease. 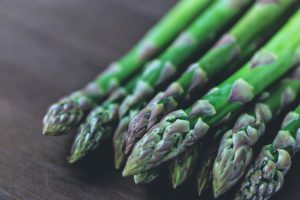 Asparagus is rich in a powerful antioxidant called lycopene, which can dilate blood vessels, lower blood pressure and aid in preventing against several types of cardiovascular disease. One review of the research found that high intakes of lycopene was associated with decreased risk for cardiovascular disease development3. Asparagus is also rich in vitamin K, which aids in proper blood clotting, along with vitamin A, vitamin E and folate. Additionally, it contains adequate levels of potassium to support healthy blood pressure. Asparagus also contains beneficial amounts of soluble fiber, a nutrient that helps to control blood cholesterol ratios. It also contains adequate amounts of the trace mineral chromium, which is needed for proper blood sugar regulation. Lastly, due to its relatively high concentrations of the amino acid, asparagine, it is a natural diuretic. As a result, it helps the kidneys excrete extra fluid and salt, which helps to support a healthy heart. Eggs are a complete protein food. Due to their quality protein content, they are able to boost satiety and aid in weight management. They are also full of essential B vitamins like B12 and folate, which can contribute to healthy homocysteine levels. Eggs also contain heart-healthy fats. Eggs can reduce your risk of developing heart disease by improving heart function. Free-range, pasture-raised eggs are high in omega-3 fatty acids, which as seen above, are heart-healthy and can help to regulate blood cholesterol. In fact, eggs are unique in that they are rich in compounds that increase ApoA, the main protein on the helpful HDL cholesterol. The more ApoA, the better off you are, heart-wise. 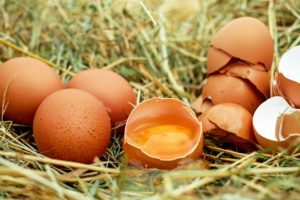 Eggs are also rich in powerful antioxidants like lutein and zeaxanthin, which protect the body and the heart from stress, inflammation and damage. Check out ten more reasons why you should eat eggs over oatmeal in the morning. Be sure to check out the best spices for preventative heart health. Use heart-healthy cooking oils when cooking. Read more about other ways you can strengthen your heart.